I remember being a new mother, holding my baby, tears springing from my eyes. My cousin told me I had the baby blues. The overwhelming feeling passed quickly, and I was able to return to mothering my newborn without (my) crying. (The baby cried plenty). Still, that feeling of being trapped and overcome with the enormity of motherhood lingered during those first three months of my son’s life. At my six-week post partum check-up, my doctor questioned me in a way that I could tell was a screening for postpartum depression (PPD). My answers were honest, but they didn’t qualify me as someone experiencing PPD. And yet, reading the essays in “Mothering Through the Darkness,” I encountered stories that resonated with me and brought me back to those difficult days as a new mother. Looking back, I think my doctor was correct to not diagnose me with PPD. My “baby blues” were short lived. But I do wish I had a book like “Mothering Through the Darkness” at my disposal to help me better understand the intense and sometimes confusing feelings I experienced in those first few months of motherhood. The beautifully crafted collection of essays, edited by Jessica Smock and Stephanie Sprenger of The HerStories Project, hones in on the too often neglected topic of PPD and Post Partum Anxiety (PPA). Yet the book also speaks to mothers everywhere, both those who experience the depths of PPD and PPA and those who do not. These essays give voice to the conflicted feelings so many new mothers experience. They reassure those who may not take to motherhood right away. Most importantly, they provide a source of comfort and clarity for women who are experiencing Post Partum Depression or Anxiety. PPD and PPA affect more than a million women every year. It’s a health crisis that needs to be discussed, not buried. “Mothering Through the Darkness” gets the conversation going. My writing friend, Kristi Rieger Campbell, gave me the opportunity to review “Mothering Through the Darkness.” Kristi is a contributor to the anthology. I first encountered her when I was going through a difficult period with my youngest child, who experienced speech delays. 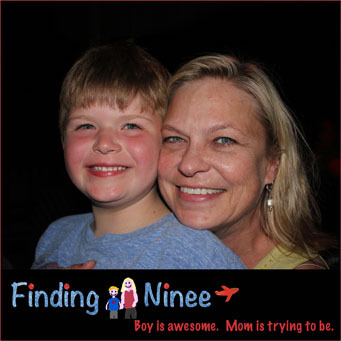 Kristi’s blog, Finding Ninee, where she chronicles her own son’s struggles with speech, struck a chord with me. I was thrilled that we eventually connected personally after I launched my own blog. Kristi and I will both be contributors to The HerStories Project’s upcoming anthology, “So Glad They Told Me,” due out next spring. What prompted you to write this essay? When my son was a newborn, I didn’t realize that not everybody has visions of terrible things happening to them and their baby, and that what I was experiencing was most likely post-partum anxiety. I hope that sharing my story and my fear has the potential to help a woman out there feel less alone during the early days of motherhood. Was it difficult to tap back into those emotions? When I first considered writing the essay, I wasn’t sure that my story would be a good fit, or what to write. I waited a few weeks and thought about not submitting at all until I remembered the night that I took a walk in the dark and sat down on the sidewalk. I experienced this strange combination of contentment for the warm evening, and total desperation. I felt terrified of dying, of the baby dying, of being worthy… In remembering that night, and others like it, the emotions from back then became easier to tap into and remember. The process of writing about those early months gave way to more memories. I think that writing about how I felt was one more step in the process of forgiving myself for not feeling good enough. In your essay, you write that you’re not sure if what you experienced was actual PPD or PPA. But that you wished you’d reached out. I feel like this book provides an amazing source of comfort and “reaching out” for those who may be suffering from PPD or PPA. Did you hope that your essay could be a source of comfort for others? I very much hope that the essay itself will be a source of comfort for others and possibly help somebody to feel more okay about sharing – out loud – that she may need help. Do you have any advice for those who may currently be suffering from PPD or PPA? First, I’d like for them to remember that they are not alone and do not have to suffer through it alone. It’s safe and okay to share their experiences with a doctor. Sometimes, simply saying “I don’t know what I’m doing” or “I don’t think everything’s okay with me” is a huge relief for new mothers experiencing PPD or PPA. While different women will need different levels of support, the first step to feeling better is knowing that others have been where they are, and reaching out to a professional. There’s no shame in admitting that we need help. Looking back, what is one thing you know now as a more experienced mom that you wish you could tell your new mom self? That babies are sturdier than they look, and that I am as well. That I’d have laughter and light, friends, and that one day, I’d really miss those early new-baby days. Do you think the emotions you experienced and write about affected how you are as a mom today? There are times when I find myself being a bit of a helicopter mom and, remembering the feelings of worry that I had so much more intensely when my son was tiny helps me to let go a little bit more now that he’s six years old. I think that feeling so much better about being a mother and about my ability to do so also makes me more fun as a parent. I love being silly with my son, dressing up with him for Halloween, playing soccer in the fading light, and knowing that everything really is (probably) all going to be okay. I think I hang onto the magic moments a bit more tightly because of the heavy worry I’ve been able to let go of a bit. “Mothering Through the Darkness” is published by She Writes Press. You can purchase a copy by clicking here. Thank you thank you thank you, friend, for reading, reviewing, sharing, and taking the time to interview me. I very much appreciate it and you, and know that all of the contributors to Mothering Through the Darkness do as well. I love that you opened with your own early “baby blues” memories. Thank you. Thanks for the review Mimi – it is wonderful! And I love that you interviewed Kristi – you know how much I adore you both! Nothing really does nor can prepare you for the shock and awe of becoming a mother. True, nature gives us that nine month that gestation period, and yet, and yet. . . . Brava for sharing, writing and promoting your experiences! I found myself nodding my noggin all the way thrghou. Pattie, we had to deactivate the free chakra healing meditation temporarily. We are getting so much traffic with Halloween that the site was shutting down. Deactivating a few things is helping for now, but we hope to have the meditation back up and running soon. Thank you for your patience. Wow, marvelous weblog format! How long have you been running a blog for?you make blogging look easy. The whole look of your website iseeecllxnt, as well as the content material! Hey, you used to write great, but the last few posts have been kinda boringâ€¦ I miss your great writings. Past few posts are just a little bit out of track! come on! results. You write great articles but you should rank your blog higher in search engines. Get MimiTime in Your Inbox! Subscribe and Get My Latest Words in Your Inbox! I promise no spam ever!